The Extention Basin and its integral flow distributors are proven innovative technology that vastly improve the efficiency of stormwater management systems. EBS is the ONLY system proven to reduce stormwater volume. The Extention Basin optimizes any detention basin and provides full peak flow reductions over the full range of design storms. Operational history is extensive and technical information is available. The Extention Basin minimizes stormwater storage volume to about 50% of conventional systems and works in conjunction with your stormwater treatment BMP's, such as filtration and infiltration. A typical EB system contains an EBS Regulator that uses optimized, custom designed flow control panels and constant flow devices. The Extention Basin integrates all other required storage amounts, such as runoff volume reduction, channel protection volume and water quality volume. It does this by distributing flows using optimized flow control panels. 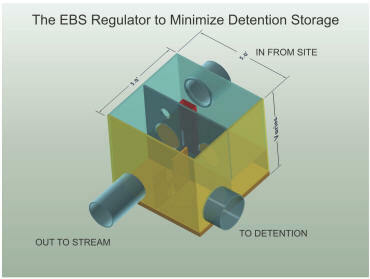 Patented EB distributes stormwater flows over the full range of storms among regulated treatment systems, detention systems and volume reducing systems in an optimization to minimize total stormwater volumes, leading to minimal stormwater storage costs. 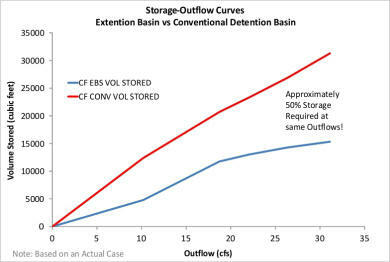 Generally, the EBS requires only 50% of the storage of standard stormwater systems. The distributions are performed using high-level mathematical techniques using our proprietary software. The Extention Basin system uses the minimal land area and storage volume possible. The Extention Basin does not "treat" stormwater, it is not a BMP on its own - it merely distributes stormwater to other BMP's and detention systems based on the regulatory requirements. The Design Engineer may specify any form of treatment or BMP.